The police used F.R.I.E.N.D.S. theme song to assure people of their assistance as the city grapples with water-logging and traffic jams. 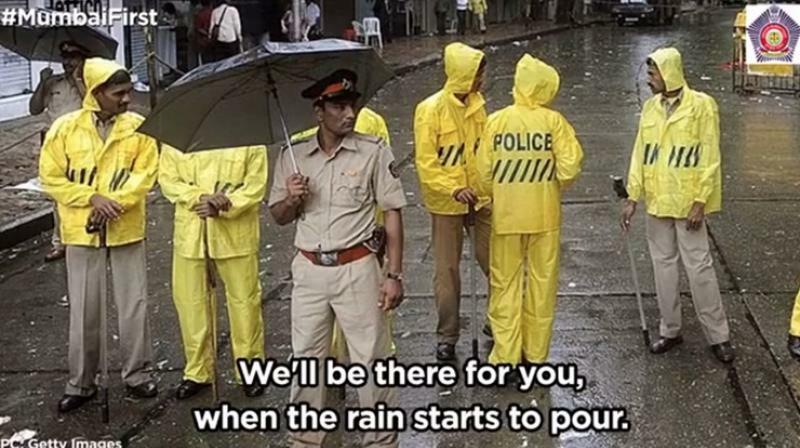 Mumbai: As Mumbai battles heavy rains over the past few days, the Mumbai police took to Twitter to render its support to the Mumbaikars in its usual quirky yet adorable manner. The tweet is in line with Mumbai police handle which often posts important messages using puns and witty one-liners to create awareness about several issues, including women safety, online frauds, road safety, and others. This time, the police used F.R.I.E.N.D.S. theme song to assure people of their assistance as the city grapples with water-logging and traffic jams. "Right here. For you Mumbai. Always. #MumbaiFirst," the tweet said. The tweet has received over 1,800 likes and 280 retweets. @MumbaiPolice you are like Joey - kind, funny, and always ask everyone "How you doin?" another Twitter user said. “Hats Off to traffic police / police of Mumbai. They are always there regulating traffic in heavy rains, floods, odd timings of day and night. Due to there selfless efforts Mumbai never stops. They deserve a big applause and a big thank you from citizens,” a fourth one said. On July 9, Mumbai police tweeted another GIF asking people to drive carefully due to poor visibility during the rains. Tags: mumbai rains, mumbai police, f.r.i.e.n.d.s.